My grandfather brought these spurs back from a trip to Mexico probably about 35 years ago. I can remember reading a book of this title when I was a child. The idea of riding well enough to earn the right to wear spurs was, for me, a right of passage. I can still remember the thrill of strapping on a pair of Tom Thumb spurs, barely large enough for my horse to notice. Spurs have been a part of equestrian equipment since the time of Julius Caesar. Simple bronze spurs (with a sharp pointed ends) have been found in Etruscan tombs from the 2nd Century and from Roman sites in Britain. At least those are the earliest recorded to date. Early Greek and Roman cavalry did not — according to contemporary drawings — use spurs, but later the Romans adopted them to help them steer their horses with their legs, leaving their hands free for weapons. 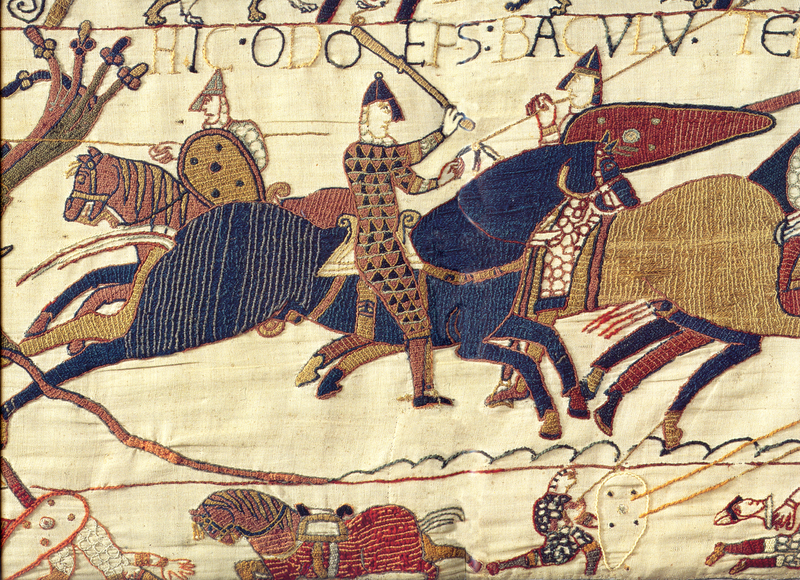 In the Bayeux Tapestry, created around 1077) the riders are clearly wearing spurs. Over time, the shape of the spurs changed. The ball and spike form developed as a way to prevent the spikes from penetrating the horses’ sides. This is the type of spur shown in the Bayeaux tapestry, which was made between 1066 and 1077. Rowels probably originated in France or Spain in the 10th Century A.D., they are first recorded in Britain in Henry III’s reign – two seals from 1240 depict the king – on one he wears prick spurs, and on the other rowelled. There is a wonderful photographic representation of spurs over the centuries here. Spurs became inexorably linked with rank and chivalry during the middle ages. You could clearly tell the rank of a Knight by the his spurs and there was much competition among knights to signal their prestige by commissioning jeweled spurs that were exquisitely elaborate. Only knights or royalty were allowed to wear gilded or gold spurs; esquires’ spurs were silver; and a page’s spurs were tinned. Unfortunately few spurs of this quality remain as most were buried with their owners. If a knight were to fall into disgrace, a knight would have both his spurs and sword would be broken. Through the fifteenth Century rowels became smaller and spur necks became longer. This was so that the spur could reach around the flanchards ( horse armor or barding). In Spain spur development was influenced both by Northern European large rowels, and by the large circular heel plate derived from Moorish spurs. The “espuela grande” travelled to America with the conquistadors, this evolved into the various designs of Latin American & Western spur. I rarely wear spurs now but I still enjoy looking at some of the fabulous western spurs, which often look more like objects d’art than items of pure functionality. And I still treasure my grandfather’s spurs — which he likely bought just because he found them attractive.